On a rooftop, Raph sneezes and hopes that the fresh air will help him get over his head cold. Thanks to his dulled senses, he is unaware that a female ninja watches him from above. Down in the sewer lair, Mikey and Leo are all set for a “Gamera” movie marathon. In the kitchen, Splinter is busy preparing a sushi dinner while Don gets to work on his computer. Back on the roof, the female ninja takes her opportunity to strike. She leaps down and chops off Raph’s bandana tails, taking them as a trophy. Raph is furious and wants to know why she’s after his bandana, but she won’t say who gave the orders. After some taunting, the ninja leads Raph through a chase down into the sewers. At his computer, Don detects some strange electro-magnetic energy signals being emitted from a nearby section of the sewers. Leo agrees that they should check it out and Mike is pulled away from his “Gamerathon”. 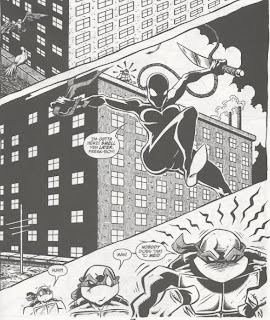 Down in the sewers, Raph corners the ninja and gives her a few wallops for his trouble. She realizes that the Turtles were as tough as Croaker had said and doubles her efforts to escape . Using a tracking device, Don leads Leo and Mikey through the sewers, trying to find the source. Don says that a strong electro-magnetic surge could set off a gas main, cause an explosion and bring a lot of city workers down into their sewers. The signal suddenly fades and they’re left unsure where to go next. Raph continues chasing the ninja, but loses her at a series of corridors. 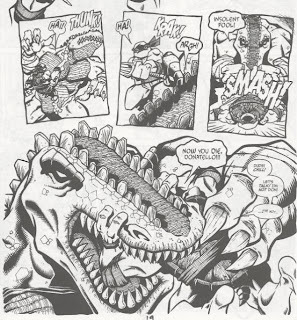 He deduces which one she went down, but before he can give chase, Leatherhead bursts out from the shadows, twice as big as ever (and with a healed eye). Confusing Raph for Donatello (whom he hates), Leatherhead trashes Raph and stuffs the Turtle in his mouth. Raph blacks out. When he awakens, he’s in Leatherhead’s lab. Leatherhead eloquently apologizes for his behavior. He says that he’s suffering from mental and physical instabilities that may be a result of the mutagen in his system or perhaps radiation. They cause him to have violent mood swings and blackouts for weeks at a time. On the upside, they have also caused his increased growth and the healing of his eye. Leatherhead leads Raph to another room and shows him the rebuilt Transmat (which he doesn’t remember constructing). Leatherhead switches it on and says that it should work properly, but he doesn’t dare test it. Following the reignited electro-magnetic trail, Don leads Leo and Mikey to Leatherhead’s lab. One look at Don sends Leatherhead into a furious mood swing (as he blames Don for destroying his Transmat the first time). Before Leatherhead can attack, a gang of Utroms in robot bodies emerge from the Transmat. They blast Leatherhead with a stun ray and drag him onto the platform. The Turtles demand answers, but the Utroms merely launch some grenades at the controls before teleporting away. The Turtles escape just as the grenades explode, once again destroying Leatherhead’s Transmat. Returning to the lair, Raph says he hopes that the Utroms were out to help Leatherhead and not hurt him. Epilogue: The Turtles lounge around on a rooftop, having run off after Splinter gave them an earful for abandoning his painstakingly prepared sushi dinner. Feasting on fast food burritos, Raph is just happy he’s over his cold. As the Turtles play around, the female ninja watches them from the shadows. *This story is continued from TMNT (Vol. 1) #45. The story continues in Tales of the TMNT (Vol. 2) #23. *The deal behind the female ninja will be revealed in Tales of the TMNT (Vol. 2) #34. 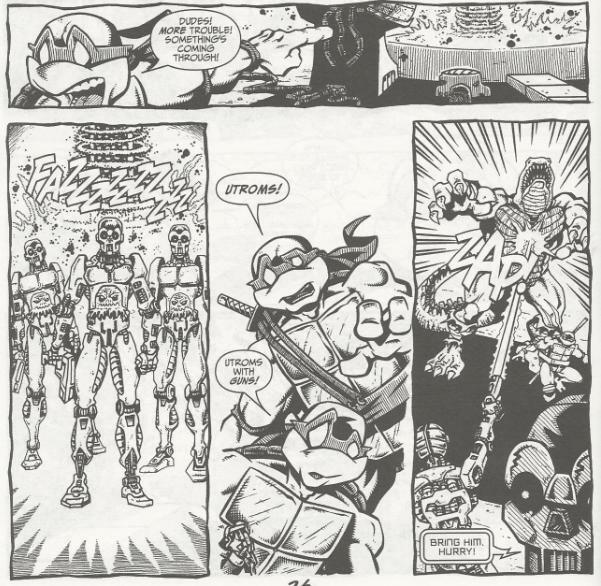 *Croaker was one of the Foot Soldiers featured in TMNT (Vol. 1) #45. *This issue also contained a bonus story by Steve Murphy, “The Risen”. Dan Berger continues his long overdue Leatherhead story, first begun back in 1992. Hey, better late than never. I’ll admit that I’ve never been a big fan of Mirage’s take on Leatherhead (and likewise, the 4Kids version). He’s a “Jekyll and Hyde” archetype in league with the Hulk or the Lizard; a pacifist intellectual who transforms against his will into a blood-thirsty brute. There just isn’t much you can do with a character like that, which is one of the reasons I have such little interest in the Hulk. My favorite Hulk stories are the ones where they give him personalities like “the Professor” or “Mr. Fix-It”… anything to escape the monotony of “HULK SMASH”. It worked great for “The Incredible Hulk” movie, don’t get me wrong, but 50 years of comic book storytelling starts to drain it of all its suspense. My favorite incarnation of Leatherhead has and always will be the Fred Wolf version. I liked the Cajun trapper outfit and the accent (great Jim Cummings voice over) and I just enjoyed the fact that he was unrepentantly evil. Sure, his motivations were shallow (he was evil for evil’s sake), but he had a lot of personality and that went a long way in elevating him above other one-shot evil mutants of the week. Leatherhead as a good guy just doesn’t do much for me (he started out as a villain in the Archie comic, but as soon as he turned good, he lost his outfit, his accent and anything approaching a personality). So with that in mind, my favorite Mirage Leatherhead stories tend to be the ones where he’s in his angry villain mode. All the fights tend to end the same way, with Betty Ross running out and screaming, “Stop, Bruce! We’re your friends! Please! Come back to us!” Er, you know what I mean. But despite a common resolution, I enjoy the action sequences, anyway. Leatherhead actually plays second fiddle in “Virus”, with Raph’s pursuit of the ninja woman being the A-plot for the first 16 pages. We won’t find out her deal for a while. In fact, it took several years just to get Leatherhead’s cliffhanger resolved. I never understood the editorial mindset at Mirage during Tales of the TMNT Vol. 2, where they’d simply let multi-part storylines gestate for years between installments, and sometimes not even resolve the cliffhangers at all. It could be very frustrating. I suppose we should all just be grateful that Berger got to complete his Leatherhead arc. The storylines involving Professor Obligado, the Foot Mystics, the Mistress and the Gang Wars never got completed. 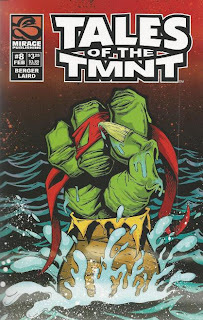 There is one other thing that always bothered me about these stories: Are the Turtles living in a second sewer lair? They gave theirs to Leatherhead in his first appearance, but they’re still shown living in the sewers in later issues and Leatherhead is most definitely not their roommate. They make a big deal about “returning to the sewers” in Tales of the TMNT #57, which takes place several years from this point, so the implication seems to be that they left the sewers after they gave their lair to Leatherhead and never returned. I guess it’s just a continuity error that can’t really be resolved. So far as the pacing of “Virus” goes, it follows two unrelated stories as one leads into the next, but provides no satisfaction for either. What it really amounts to is two separate preludes: one for “Attack of the Replicants” and one for “Splinter Cell”. As preludes for those two stories they work perfectly well, but as a singular tale left to stand up on its own, it’s a little unfocused. Leatherhead getting dragged away by the Utroms at the end is random as all hell, too. Berger’s art is his usual good stuff; I love how cartoonishly expressive his Turtles are, but he still manages to employ a menacing look to them when the moment calls for it. He’s a very talented cartoonist, not just in regards to his characters but also his backgrounds and layouts. In the editorial for this issue (which is an interview with Berger conducted by Murphy), Berger says that drawing has caused him numerous physical problems, which may explain why he only penciled TMNT on rare occasions. It’s a shame, too, as I’d have loved to have seen much more of his work. 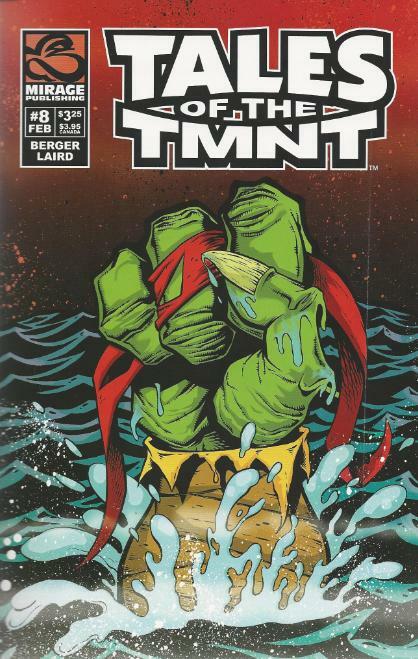 The frontispiece for this issue is by TMNT Adventures’s most underused talent, Michael Gaydos. He did great work on that book, though almost always as a fill-in or a guest artist on miniseries or in the Specials. Even though it’s only a frontispiece, it’s still great to see him again and just how his TMNT style has evolved since the 90s. “Virus” sets up a lot of important plot threads for Berger’s “Leatherhead trilogy”, as I call it, but that’s also its shortcoming: it’s nothing more than a lot of set-up. The real action gets underway in the next part.